I have mentioned the inverted VIX on two previous occasions, most recently about 5 ½ months ago in Inverted VIX Still Bullish. In the chart below, I continue my practice of displaying the inverted VIX in a weekly chart and looking at longer term patterns. A lot has changed on the volatility front in 5 ½ months, as evidenced by the fact that the current inverted VIX is farther above its 50 week moving average than it has been at any time since the record 64% one day spike in the VIX on February 27, 2007. Perhaps even more interesting is that in this five year lookback period covered by the chart, current VIX levels look positively middling and unremarkable on an absolute basis, even though the VIX has come a long way in a short time on a relative basis. A new VIX floor in the 15-16 range is not unreasonable. It is higher than the new VIX floor of 13-15 I was calling for on August 1, 2007, but given all that has transpired in the markets over the past ten months, the fact that these numbers are even in the same ballpark is something to ponder. this will of course be an data issue. At the moment all data supplier like optionsXpress, Stockcharts, Yahoo -even the CBOE itself- show the same incorrect VXO data (o/h/l/c 17.39/17.65/9.44/12.86). I think that will be corrected tonight. Bill: Did you receive the two emails that I sent you a few hours ago including a visualization of the distribution of all real VIX values since 02/01/1990 (showing a almost perfect lognormal distribution) ? Thanks so very much. 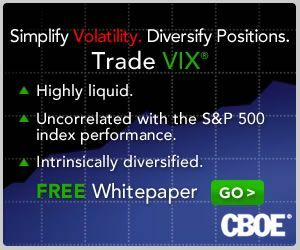 The CBOE site just posted their 05-19 end of day values, and they have VXO at 12.86 as well. It will be interesting seeing if this value gets changed. VXO devotees are confused by today's close. VXO did apparently trade down as shown on this 5 minute chart. And it traded down with ESM8 which is counter-intuitive for me. I'm looking at a 1 minute intra-day chart of the VXO and it shows some strange activity to the downside starting just after 3:15 ET, with the VXO dropping steadily from the high 16s all the way down to 9.55 over the course of about 20 minutes. The index then bounces back up to 12.86, with no data after about 3:53 ET. It looks like a data malfunction, as the VIX, VXD and VXN were all moving in the opposite direction of the VXO values during this period. P.S. Frank, I got the notes and replied directly to that email address. Thanks for the image. None of the other CBOE data I use show anything out of the ordinary, so I am going to assume for the moment it was a computer error of some kind. For now I'll use VIX today with a note to check further over the next few days. I like your inverted VIX study very much. I do note that whereas most of the major bottoms of prior years had inverted VIX making a "higher low" at a lower price low, this "sentiment divergence" did not happen in March 2008.
the CBOE at least adjusted the VXO close from 12.86 to 16.68 a few minutes ago (in their CBOE Daily Market Statistics only; CBOE's classic quote page still shows the incorrect values). I think the low (9.44) will be adjusted shortly as well. Limited Upside for Consumer Discretionary Sector? Time for Biotech to Turn Around?